MARSHALL HUNTER, a prominent farmer and old settler of Ripley Township, Bond County, Ill., was born in Ripley Township, and within a-half mile of where he now resides, March 1, 1820. He is a son of Joseph and Elizabeth (Maben) Hunter. His grandfather, John Hunter, was an Irishman by birth, and was a young man during the Revolutionary War. He was the son of one Thomas Hunter, a wealthy landlord in Ireland, and during his young days was somewhat wild, rebelling against the restraints placed upon him by his father, and this resulted in his running away from home with the determination to emigrate to America. There was only one difficulty in the way, which was that he did not possess enough money to pay his passage. However, he determined to make his way to the New World, and, as no better opportunity offered, he joined the British army, and was shipped to America as a soldier. He came with no intention of participating in the war, and as soon as opportunity offered after landing on American soil, he deserted from the army and made his way to North Carolina. Later, he went to Tennessee, and there Joseph Hunter, our subject's father, was born, being one of a family of seven boys. With this family John Hunter removed by team to Illinois and settled on land not far from where the present generation of Hunters now live; but the original settlers have all passed away. At death Thomas Hunter, the wealthy Irish landlord, left his son a few hundred pounds of his fortune, but as the latter was not given an equal share, he refused to take what was offered and died without claiming it. 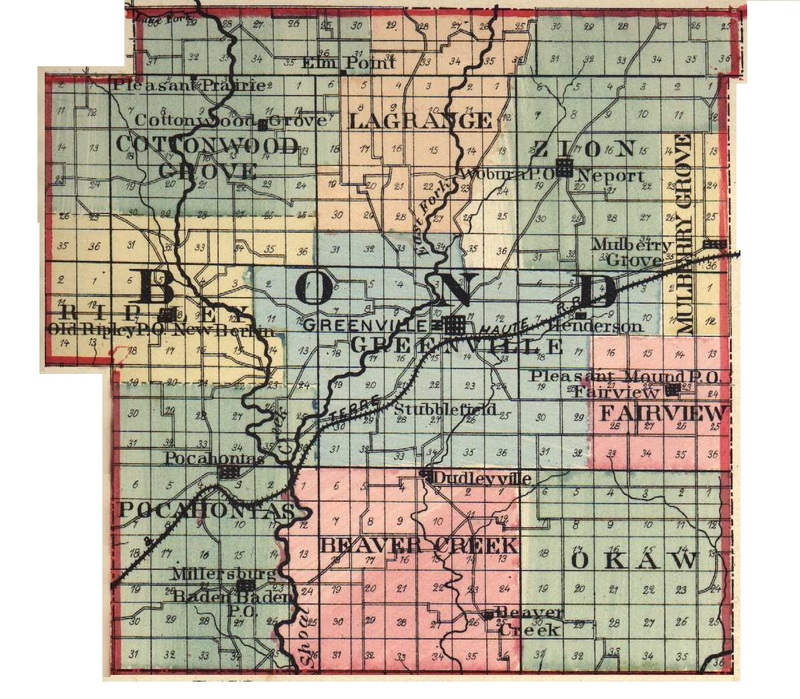 Of the seven sons who came to Illinois with him, John died in Kansas; Samuel, in Texas; Thomas, James, William, Daniel and Joseph, the latter the father of our subject, all died in Bond County. Of these, Thomas. Samuel and Joseph served in the War of 1812. The mother of our subject was also a native of North Carolina, and she bore her husband a family of seven children, of whom our subject was the second. Of these, Susan died when a girl of sixteen years; Mary married Daniel Briggs and died in Bond County; Elizabeth died when a young lady; Steward Nelson died in childhood; John is now living in Johnson County, Tex. ; and William M. lives on the old homestead. Our subject was reared on the farm and received but little education, as school advantages were limited in his boyhood days. Much of the time was occupied in assisting in the clearing up of the farm. In 1843, he married Sarah E. Myers, a native of Bond County, but she died ten months later. In 1846, he married Elizabeth Glenn, a native of North Carolina, and a daughter of Alexander Glenn, who was brought to Illinois when she was a child of one year. Mr. and Mrs. Hunter had a family of seven children, six boys and one girl, three dying when small. Those who reached mature years were Mary, wife of William Ward, who resides in Ripley Township, where he is the present Supervisor; Samantha, wife of John Willeford, a prominent young farmer of Ripley; Alice, wife of William Cacahuens, resides on the farm of Mr. Hunter, who has lived with them since the death of his wife in February, 1883; Joseph W., the second in the family, was born April 5, 1849. He now has a farm adjoining his father's. Mr. Hunter was married to Miss Harriet M. Sybert, whose parents were also early settlers in the county, her father being William B. Sybert, a prominent farmer of this township. Mr. and Mrs. Joseph Hunter have three children: Alice M., Henry Albert and Russell Hall. Mr. Joseph Hunter is a prominent member of the Masonic fraternity, Gordon Lodge No. 473, of Pocahontas, in which he has been quite active, and he is also a member of the Farmers' Mutual Benefit Association. The Hunter family has been Democratic since the original emigrant first landed on American soil, and the present members of the family still continue in the same faith. They are also all members of the Cumberland Presbyterian Church, Joseph being at present a Deacon in that body. Mr. Marshall Hunter is no doubt the oldest living pioneer residing in Bond County. Extracted 21 Dec 2016 by Norma Hass from 1892 Portrait and Biographical Record of Montgomery and Bond Counties, Illinois, pages 496-497.